NAKHON SI THAMMARAT, Aug 15 – More forestry and national park officials will be dispatched to Thailand’s southern province of Nakhon Si Thammarat to fight forest fires that have damaged large areas and have showed signs of getting worse, a Thai official said. 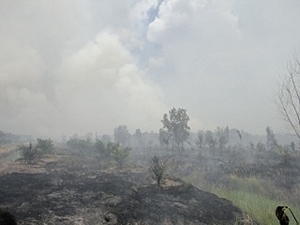 Thanakorn Raktham, chief of the forest fire station in Pak Panang District of Nakhon Si Thammarat province, said the fires have ravaged peat swamps in three national parks and severely affected residents in five nearby districts. Dust has accumulated at a higher level, he said, warning that the worsening situation could drag on until September unless it rains. The Ministry of Natural Resources and Environment has reinforced forestry and national park officials to help extinguish the fires and predicted that the situation should be under control in at least a week. The fires are man-made and the Fourth Army Region has been requested to take action against those who set fire to the area so as to clear the land for commercial plantation. Department of Pollution Control director Vichien Jungrungrueng expressed concern that the worsening situation was intensified by atmospheric haze from forest fires and annual burning in Sumatra, Indonesia, which has spread over several southern provinces of Thailand. Two air-quality measurement vehicles will be sent to Nakhon Si Thammarat and Trang provinces to check the level of dust in order to correctly evaluate the situation and dispatch assistance to people there, Mr Vichien said.